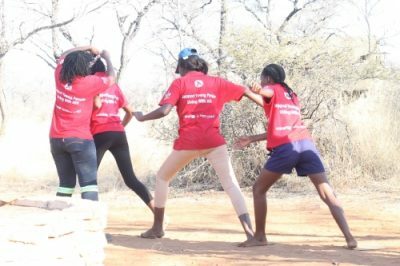 HIV-positive teens gathered at B2Gold’s Otijikoto Mine Nature Reserve for a weekend of team-building exercises, support, and discussions about the importance of adherence to treatment. All teens need consistent opportunities to build self-worth, explore their gifts, and feel the support of peers and adults. For teens who are HIV positive, the everyday pressures and fears of adolescence (rejection, bullying, gossip) can be amplified, making these opportunities especially important. 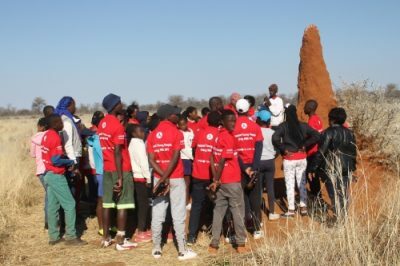 In Namibia, adolescents and young people, especially girls and young women, continue to be disproportionately affected by HIV. In response to these realities, in late August, a three-day Teen Club Retreat was organized by the Katutura Hospital Paediatrics Communicable Disease Clinic (PCDC) team, in collaboration with B2Gold, Champions for Life, and the International Training and Education Center for Health (I-TECH). Fully funded by B2Gold and hosted at its Otjikoto Mine Nature Reserve, the retreat included 49 teens from the clinic (31 girls and 18 boys), who were joined by clinic doctors, nurses, and counselors as well as facilitators from Champions for Life, a psychosocial-spiritual program for children, adolescents, and young adults with the challenges of being infected or affected by HIV. keep teens engaged in care. I-TECH Namibia’s Sharon Mambo, an HIV Pediatric Expert Nurse, served as a chaperone and as one of the key organizers of the retreat. Mambo led a discussion on the importance of treatment adherence and viral load suppression. In addition, she tasked one of the teens with facilitating a discussion on “transitioning,” the process during which adolescents move from paediatric HIV care to more independent adult care. At Katutura hospital, this means accessing health services at an adult ART clinic. Teen Club members enjoyed a tour of the B2Gold facility, as well as nature and wildlife walks. The team from Champions for Life also held a full-day seminar titled “NICHE,” focused on self-image, identifying gifts and abilities, and creating one’s vision for the future. This was done through music, dance drama, group presentations, and poetry. Mambo has also been working with teen leaders from the group to support other facilities in Windhoek to establish their own Teen Clubs.